Alayna Longstaffe was raised in Strathroy, Ontario. She graduated with distinction from Western University in 2005 and earned an honors degree in Mathematics. Alayna obtained her law degree from Dalhousie University in 2008, where she was the recipient of the Arthur Allister MacBain Memorial Scholarship and the D. Kerr Memorial Prize in Maritime Law. She completed a Business Law Specialization Certificate while at law school. After articling with a prominent Toronto full service business law firm where she obtained experience in taxation, intellectual property, bankruptcy and insolvency, competition and corporate law, Alayna joined Wolfe, Smith & Forster LLP in 2013 as an associate practicing in the areas of wills and estates, real estate and corporate commercial law with the mentoring of Cecil Wolfe. 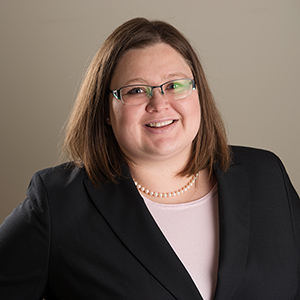 Alayna is focused on helping her clients find the right solutions for themselves, their families and their businesses. She is friendly, approachable and takes the time to ensure clients understand and are comfortable with the legal services provided to them. Alayna and her husband are the proud parents of a boy and twin baby girls and are thrilled to be raising their family in Wellington County. In her free time, Alayna enjoys knitting, Canadian literature, photography and exploring the outdoors with her children. She is a member of the Wellington Law Association, the Ontario Bar Association and the Canadian Bar Association.